By the end of 1987, Puffin books had published more than thirty Fighting Fantasy game books, as well as four books in the role playing series of the same name - including Out of the Pit, Titan and The Riddling Reaver. Armada Books, since absorbed and lost in the depths of HarperCollins, had had some measure of success with their own fantasy game book series, GrailQuest, a tongue-in-cheek series set in the time of King Arthur, following the often humorous adventures of hapless Pip under the tutelage of Merlin. The author, J. H. Brennan, had already dipped his toe in the creation of role playing games, with the Man, Myth & Magic RPG released by Yaquinto Publications. Brennan has a style all of his own, peppered with a certain irreverence and good humoured disdain for the complexities of role playing games, "with rules coming out of their ears." With the moderate success of Grailquest, who better to turn to for a kid friendly role playing book to rival Fighting Fantasy and the more serious brimming box brands? The Monster Horrorshow is a 256-page paperback book, purporting to provide all you need to run a multi-player adventure game. The format matches the slightly larger than standard paperback used by similar games of the time like Maelstrom and the Advanced Fighting Fantasy volumes. The artwork on the front cover certainly seeks to grab attention, with a great toothy reptilian beast glaring through a rusted gateway, the words 'Monster Horror Show' cast into the surface (the only place where the words 'Horror' and 'Show' appear with a space throughout the book). The interior features occasional black-and-white art throughout, by Philip Hood - who would go on to illustrate many and varied books, many for children. Philip was shortlisted for the Royal Watercolour Society Sunday Times Prize in 2009. The centre of the book, between pages 128 and 129, feature two sheets of thicker card. The card inserts feature 30 small illustrated tokens intended to form a wandering monster deck for use during the game. I believe the first printing probably was the only one, again similar to Maelstrom, published three years earlier and never reprinted beyond the first run. The book has no table of contents, but does break up into key chapters. But, first a note on Brennan's style of engaging the reader. I found his humour and good natured banter quite endearing, and I desperately tried to imagine how it would have come across to a pre-teen reading it in the late 80s. Brennan has a humour that reminds me a little of Paranoia, perhaps - the sense of the game designer guiding you through his great work that outstrips all those serious role playing games by cutting out all the boring nonsense and presenting you with nothing but the essentials. I rather liked it, but it might grate on adult sensibilities. The first chapter deals with the initiation and assessment of the player as a potential Werewizard. Yes, Werewizard. In Horrorshow, the referee or gamemaster goes by the title of Werewizard. To qualify for this role you have to find your way out of the Labyrinth of Squat, a 36-reference solo adventure that introduces you to some of the basic rules. This approach to learning rules was consistent with other games of the time - and it works well enough here. The adventure mirrors Brennan's style from the Grailquest and Demonspawn series by including a specific single reference relating to the character's death (here, paragraph 13) - from where, if you have plans to become a Werewizard, you need to reincarnate yourself and go back to paragraph 1. The Werewizard's Kingdom follows - after you've qualified - with 19-pages of rules and guidance on starting to play the game for the first time. It guides the reader through getting friends together, finding an ideal spot to play, and understanding that in Horrorshow every player plays themselves, with a specialty layered on top, selected from Fighter, Wizard, Healer and Trickster. Brennan specifically plays on the complexities of other games spending ages on the business of putting characters together and selecting their class. Essentially, character creation in Horrorshow boils down to four steps - choose a specialty, note down you have 100 LIFE POINTS, roll 2 six-sided dice and multiply by ten for your starting cash in gold pieces, and be aware that anything a player wears or carries is available to their character at the start of the game. You can see how this could go terribly wrong in the hands of a bunch of Munchkins, but for an introductory game intended for quick-and-dirty role playing, the idea suits the theme of the book. Forget about the complexity of acting and piles of numbers - you all start more or less the same, and you are your character. The rules themselves take up 13 of the 19 pages and boil down to a few basic checks on 2d6. Roll 7 or higher to hit, then roll 2d6 multiplied by four for damage. Weapons add to the roll before multiplication, while armour comes off the calculated damage. Everyone can potentially cast spells or heal people, but Wizards and Healers do it better and need a lower number on 2d6 to succeed. A Werewizard can choose to run Group combat as a big lump of damage shared out at the end to everyone, or fight at an individual level. Anything else, you use the The Absolutely Anything Table - where you roll 6d6 and try to get 36 or higher, adjusted by the difficulty of the task. For an average task you get +18, while Utterly Impossible offers no bonus modifier at all. Brennan suggest that you could go utterly freeform and only use the Table to run everything - where the Werewizard assesses the chance of success based on all factors involved and the players roll to determine their success. The degree of success falls to how much you can roll over 36. It all feels terribly stripped down and almost modern, a simple core rule that allow you to agree on how hard it might be to achieve something and then rolling dice to determine the degree of success or failure. With a single page of the book, you can run the whole game. In the next section, also 19-pages long, you have advice on How You can become the Greatest Werewizard in the Known Universe and How you can write the sort of professionally polished Horrorshow scenario that positively commands fame and fortune. I really enjoyed reading these pages, because in the hands of a neophyte gamer with no clue where to go, the advice here tells you just to have a good time. If you forget all the rules - and you have no excuse if you run everything off of The Absolutely Anything Table - then remember 'Give your players a good time' and take it from there. It also tells you about atmosphere, sound effects, passing notes, preparation, and running games that match the sort of thing your players clearly want to play. It all reads a solid advice that I'd happily pass on to anyone thinking of coming to gaming for the first time worried about where they need to go with it. The Chamber of Mysteries and The Monster Cages fill the next 60-pages with spells and creatures. Aside from a small basic spell book, characters need to find most spells in the game itself. Wizards have Spellbooks, but anyone else can manage simple spells from scrolls and Tricksters can get a list of their own spells once they've discovered they have the ability to work a little magic themselves. Casting spells requires another 2d6 roll equal or over a target number, with a loss of Life Points regardless of success or failure. Specific spells costs a set amount of Life Points to cast, from +0 upward to +40 for the mass lethality of the Firestorm spell. Brennan has a touch of Tunnels & Trolls humour in some of the spell names, which he also used in the Grailquest books (where the joke usually came down to ridiculous acronyms). The basic spells for wizards provide essentials of protection and detection, with the more varied realms of offence, charm and enchantments in the wider spell selection. In The Monster Cages we have two varieties of creature, the Wandering Monsters and Scenario Monsters. The former relate the cardboard section in the middle of the book. The Werewizard keep a pile of these cards near him and when it seems appropriate can draw from the top and throw a creature at the party. For a challenge, the Werewizard can throw a die as well and that many creatures appear at the same time - or he can draw that many cards for a mixed group. The Scenario Monsters break down into sections like Undeads, Shapeshifter (including the fearsome Werehare), Demonics, Astrals, Animals and Fun Monsters (anyone for a Phantom Sausage or a Dire-Granny?). Oddly, we don't have a single Dragon on show, just the Wyvern (amongst the Wandering set) who gets mistaken for a dragon. The power level of the Wanderers varies, while the sections list creatures from low power upwards. The difference just comes down to tweaks in the numbers - bigger Life Points, smaller number to beat for a hit, and layer on more lethal weapons and better armour. In an Absolutely Anything Table driven game, none of the crunch matters much, just the description of the monster and how it might go about rending the party limb from limb. Brennan fills the rest of the book with an adventure, with some briefing staging advice, four maps and a lot of information on the various areas. Every location has a Read Aloud section, a quick bit on responses to the most likely questions, and a For Your Eyes Only bit with anything else that warrants attention. The four key sections of the adventure offer wilderness exploration, a village, an abandoned underworld, and a hamlet with a mystery. The adventure provides plenty of guidance and goes for a fairly ambitious mystery, which I wouldn't dream of spoiling here. It would be quite an achievement for a newcomer to pull it off, but I'm sure there'd be quite a sense of fun and achievement at the end if they did. The final section of the adventure includes several pages of non-player characters with brief details on their intentions and personalities along with a portrait. As the final step of the adventure it becomes a bit of a sandbox, of people, location and mystery, for the now skilled Werewizard to come to the fore and show off his chops. I read this back in 1987, and have read it again since. Reading it now, I can see how it could appeal and I reckon it might still work as a tool to engage youngsters in the gaming hobby. Aside from the daft name for the game's referee, Brennan sets the tone just right for the entertainment of the curious newcomer. The approach of a game with so few mechanics and an over-riding way to run the whole thing from a single table works well, even if it wouldn't satisfy everyone and you'd outgrow it before long. What's the business with the Horror, you might ask? Well, I'm not sure. I think it might be a ploy to appeal to ghoulish kids who like the look of a fanged monsters. Werewizards and Horrorshows make the game sound like something worth the £2.50 asking price- and once you start reading you'd probably forgive Brennan for not really taking the horror bit seriously. 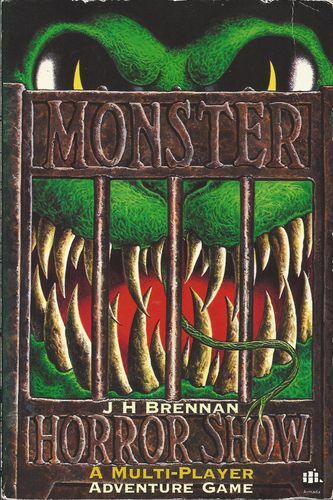 For the time, when Fighting Fantasy ruled the bookshelves, the Monster Horrorshow provided an alternative and another step for those who enjoyed Brennan's Grailquest book. I find the advice for running the game very appealing as a guide - and could easily see parents running this for their kids the first time then leaving them to it with Brennan's sage words to offer them support. I'm not sure it rates as a classic, but for something of its time I recommend you pick it up if you find a copy in a secondhand store or loitering for pennies on an auction site. Great review Paul, thanks for shining a light on this RPG. I loved Brennan's GrailQuest series as a kid. I'd not heard of this RPG before your review, so I'll keep an eBay search active on the off chance it pops up. I was a little surprised by the lack of Net-wide coverage - as the game didn't have an entry here or even in Wikipedia under Brennan's entry. It fits somewhat into the Tunnels & Trolls mode of simplistic gaming. The advice to the Werewizard on how to run a game and make it fun really stands out in my mind. I never saw this back in the day, thanks for the great review! I was 15 when this came out and right at the end of the period when I could beg for a book from my parents. I had just started my first part time job, so after this I would rely on my own cash and gifts to get new books and games. Fighting Fantasy came far more easily, as showing an interest in a book in my early teens probably warranted encouragement. I had the whole of Dragon Warriors and the Fighting Fantasy RPG books at this point, so Monster Horrorshow no doubt appealed to me for the promise of a whole game in one book - and with card tokens as well! Corgi's Tunnels & Trolls paperbacks and Darksword Adventures the year after this... Well, it was a good time in paperback-sized gaming! I had Darksword Adventures back in the day; it never saw play. A review of that dog-eared book would be welcome, no expectation. I'll add it to my list of considerations! I have never heard of this! How did that happen? It's possible some parts of my collection exist in a parallel dimension. Yes, I've played Grailquest but never knew this existing; thanks! It has been my pleasure. I think it's important not to leave these books on the shelf for too long... they might go off. You inspired me sir! I took a look around and found that there were a few used copies floating about the internet. Now there is one less floater. I just cracked it open an hour ago and I'm not yet a full-fledged Werewizrd, but I'm working on it! That intro adventure is no joke... well, parts of it, but in a good way. I am enjoying the humor of the book, and the system itself is pretty snazzy. I like my dice cubed and in small amounts. Good stuff!